For many years, leaders of The Church of Jesus Christ of Latter-day Saints, the Mormon Church, have sponsored advertising campaigns for various reasons. Several decades ago, the Church place multi-page ads in Readers' Digest Magazine explaining the basics of the gospel and inviting people to meet with Mormon missionaries. An interesting result of these ads was the exposure of a number of people in Africa to the basic tenets of the gospel. In one area, a group began meeting together in anticipation that the Church would eventually establish a formal presence there, which it eventually did. Later, the Mormon Church sponsored television ads. Such ads were meant to enhance family life and were not aimed at drawing converts. These were messages for husbands, wives and parents. In 2010 The Mormon Church began making short videos about everyday Mormons in an effort to show who Mormons are and what they are like. This campaign was a response to studies which showed that most people have erroneous ideas about who the Mormons are. Some think Mormons are like the Amish, which is untrue, and some equate members of the Mormon Church with fundamentalist polygamist groups, also a false notion. 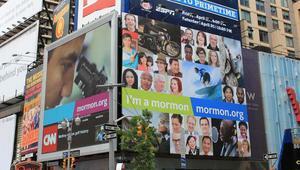 The diversity of Mormons is reflected in New York City, where Church membership has grown rapidly in the last decade. Since 2000, membership has increased by 75% to 78,000 members in New York state. The common thread that ties the diverse membership together is their desire to follow Jesus Christ. Because of these ads in New York City, the missionaries in the area have been getting calls from local hotels like the Ritz Carlton and the Marriott because people keep taking copies of the Book of Mormon as souvenirs and they need replacement copies. Starting October 3, 2011, the LDS Church launched the "I'm a Mormon" campaign in 13 cities in the U.S. and Australia. The campaign includes television spots, billboards, and ads on buses and on the Internet. The media ads are running through March 2012 in Phoenix, Arizona; Atlanta, Georgia; Denver, Colorado; Spokane and Seattle, Washington; Austin and San Antonio, Texas; Omaha and Lincoln, Nebraska; and Indianapolis, Fort Wayne and South Bend, Indiana. The campaign is also spreading internationally with ads in Brisbane, Australia. The LDS Church website [http;//www.mormon.org Mormon.org] was launched in 2001 in preparation for the 2001 Winter Olympics to be held in Salt Lake City, Utah. At that time, the main purpose of the website was to present the main doctrines of the Church of Jesus Christ. In 2008, the LDS missionary department and Bonneville Communications led a massive research study that showed how unfamiliar people were with Mormons and Mormonism. Those who met real Mormons were favorably impressed by them, but those who had not tended to hold unfavorable opinions borne of lack of information. The Church decided to put real Mormons on display for everyone to meet. In 2010 the Mormon.org website continued to explain basic LDS doctrines, but also introduced Mormons in short film clips that showed their diversity, vocational interests, and hobbies. Members of the LDS Church were invited to add their personal profiles to the website, and they have done so in droves. The LDS Church has embraced electronic media as a way to take the gospel to the four corners of the earth. A new website, MormonTopics.org teaches more Mormon doctrine. The church’s Facebook page has 835,000 fans. Its potential Facebook reach is 115 million (fans and friends). The church’s Youtube channel has 19,000 subscriptions and 30 million video views. The church’s Twitter account has 21,000 followers. The church’s GooglePlus +1 account lists 3,700 friends. This page was last edited on 14 November 2012, at 01:54.